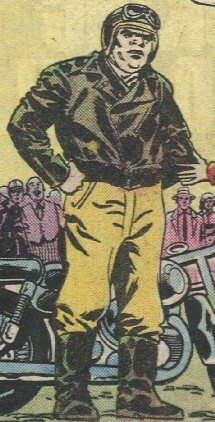 Group Membership: Head of the Heaven's Devils M. C.
Powers/Abilities: Iron Mike is extraordinarily strong and tough (before his spirit was broken, anyway). He is also a talented biker, and uses a motorcycle with great proficiency. He also carries a gun. He formerly led a group of tough bikers. 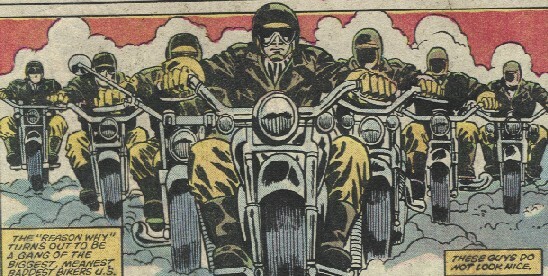 (US1#6 (fb) - BTS) - Mike's mom wanted him to be an accountant, but he became a biker instead, eventually coming to lead the Heaven's Devils M. C.
(US1#6 (fb) - BTS) - Iron Mike led the Heaven's Devils M. C. to raid the town of Peaceful Vista, riding roughshod over the people and place, as well as the drivers of any rigs that brought supplies into the town. In response, "Jobber" Carosella sent U. S. Archer out to investigate, and he brought his adoptive mother Wide Load Annie with him. (US1#6) - No sooner had US and Wide Load arrived when Iron Mike and the Heaven's Devils M. C. tore into town, preparing to loot their supplies. Mike bullied the mayor into allowing him to take the supplies, and US tried to stop him, punching Mike square in the face...and hurting his hand. When Mike chased him, US wisely chose the better part of valor and took off, grabbing Wide Load and starting up the US1. The special truck made short work of the bikers, but Mike then challenged U.S. to a race "for the bossin' rights to Peaceful Vista. The US1 had its trailer section removed, and swiftly caught up to Mike after he took an early lead. Though Mike kept cheating--including nearly running over a young boy and forcing the US1 to swerve to stop this, the US1 stayed right on his tail. Mike then pulled his gun and rushed the US1, but it shot out a stream of tear glass which blinded him, and he crashed into a lamp-post. Though he lost, Mike had no intention of honoring the deal. He planned on smashing Archer and then trashing the town, but when Wide Load Annie revealed that it had been her driving the rig. Devastated by this humiliating defeat, Mike wandered off in a daze. U. S. suspected that Mike meant have been an agent of the Highwayman, but Mike had no idea what he was talking about. Comments: Created by Al Milgrom and Frank Springer. For the record, U.S. cheated, too, sort of. He was using remote control on the US1 to help out Annie during her race with Iron Mike. I bet the upstanding U.S. only took control of the truck when Mike cheated (saving the child, and operating the tear gas). Happy 20th anniversary to Iron Mike, King of the Bike! I think King Cycle might dispute his title, though. 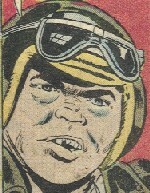 Maybe they should get together with Big Daddy Dawson and Brahma Bill to form the Legion of Jag-Off Bikers.